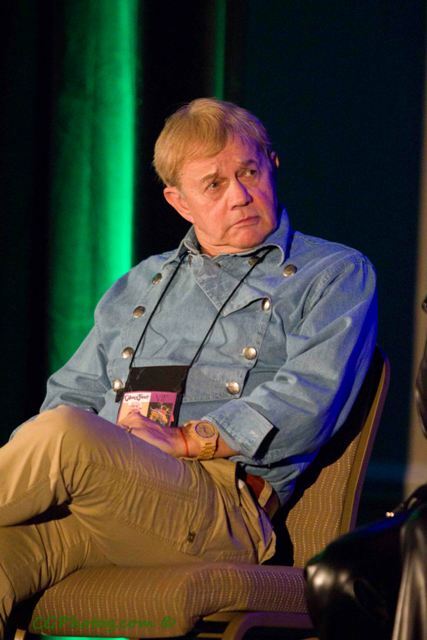 In this the 50th anniversary year of “Doctor Who”, Examiner had the amazing opportunity to sit down with Frazer Hines at the GalaxyFest convention in Colorado Springs, Colorado. As Jamie McCrimmon, Frazer Hines appeared in 116 episodes of “Doctor Who” which is more than any other companion. Not only did he travel in the TARDIS with Patrick Troughton from 1966-1969, he also appeared in “The Five Doctors” and the “The Two Doctors”. Frazer Hines discussed with Examiner his thoughts on the longevity of “Doctor Who” and even the upcoming 50th Anniversary Special. Q. This year marks the 50th anniversary of “Doctor Who”. Did you actually think it would as big of a phenomenon? A. It was a children’s television show at 5:15 after the football results on a Saturday in England. I never dreamt that something, well forty odd years later, I’d still be visiting the world. I was supposed to be in one story, four episodes of “The Highlanders”. I have seen all parts of Australia, America, here I am in Colorado Springs and I am going to Houston later on in the year for the 50th anniversary. I am seeing the world and talking about a program that is very near to my heart. Q. You do an amazing impersonation of Patrick Troughton. Did he ever get to hear it? A. I don’t think he did. Patrick’s been dead amazingly over twenty years now, twenty seven years or something like that. It came about when I was doing the first Big Finishstory of “Helicon Prime”. It was a Second Doctor and Jaime story and in a coffee break I did a line like Patrick. The producer came through on the mic and went “Fraser you sound like Patrick there.” I said “Well, I do Patrick when I explaining a kind of a gag.” He said “What sort of gag do you do?” I explained and it became that’s how I did it. I’ve done a couple of Big Finishes. The one with David Warner, who worked with Patrick, he said it is amazing which is nice. When we do a Big Finish and somebody does a Welsh accent, actors take the mickey out of each other so we don’t get too big headed. David Warner said “I just didn’t realize, I thought that Patrick was in there.” I’ve just did one with Michael Troughton and I was a bit kind of, crikey I am doing his father in front of him, even though luckily we were in separate booths. It is like me doing an impersonation of you in front of you. You are going “Do I really sound like that?” Michael, god bless him, said “Fraser, there are certain lines you say that give me goose bumps!” Which was wonderful! Q. Many of your stories in the TARDIS have been lost. If you could pick only one story to be found, which would you choose? A. “The Higlanders” because that is my first story. People say “What’s your favorite story?” If it hadn’t been for “The Highlanders” I wouldn’t be here talking to you. I found a picture recently in someone’s garage of the first ever publicity picture of me and I’d love to see “The Highlanders”. Q. You are known for your love of horses and cricket. Do you have any upcoming events? Q. Is there any chance that we will see you in the 50th Anniversary Special? A. I haven’t been asked yet, no. I’ve done the Big Finish one, which is the audio version, which is brilliant. I just wish the BBC would film that because it’s a damn good show. It’s got seven or eight Doctors in it and companions running down corridors seeing each other going “Who are you?” That’s what I’d have liked the BBC to have done, that would have been great. Previous Previous post: Our First Episode Is Now Online!